Radiant Heating makes all the renewables more green!! Radiant Heating makes Mod/Con boilers more green!! Properly designed Radiant heating has the lowest design water temperatures out of all the systems. This means you can get more energy out of your system. Efficiency has a lot to do with delta tee. Radiant heating lowers the delta tee in most systems. 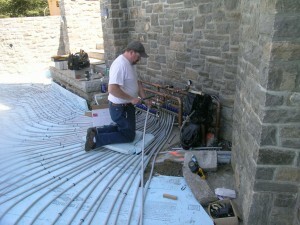 Radiant heating is growing very fast in popularity here in the United States. The systems are much more comfortable and durable then the older systems. Click on Why Radiant? to learn more about radiant heating and how it works. Click on History of Radiant to learn the difference between the old copper systems of the 50’s and the PEX systems of today.